Simple and effective blade fuse holder with ABYC/USCG approved protective cover. 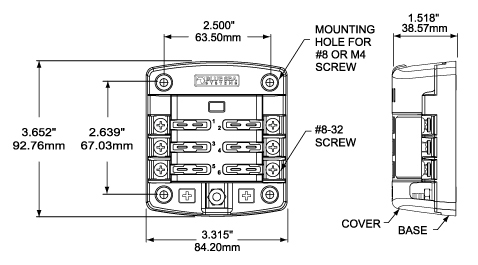 Features a common positive #10-32 stud for connection to the positive supply and screw down connectors for spade or ring crimp terminals. All connections are tin plated copper for corrosion resistance. 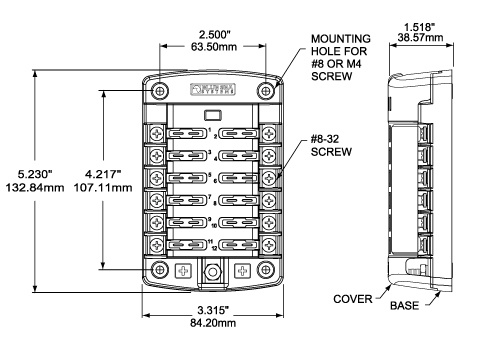 The cover features storage for two spare fuses. Accepts ATO or ATC blade fuses (not supplied). Includes 1 x 15 amp blades fuse and 20 x blank (write on ) labels. Also compatible with Blue Sea Systems' Small Format Labels for circuit identification. Available in 6 fuse and 12 fuse versions.